OFF-BROADWAY: The Wayfarer (in Obie-winner Caught In The Act at HERE, John Christopher Jones, director); The Seagull, Scenes From An Execution (Blue Light Theatre Co.); We Won’t Pay! We Won’t Pay! ; Twelfth Night; Henry V; The Promise. REGIONAL: Tartuffe (Depot, John Christopher Jones, director); Comedy of Errors (GeVa); Scenes from an Execution (Olney); Dracula (Pirate Playhouse); The Matchmaker; Under Milk Wood (Dorset). FILM: Living in Oblivion; Cherry. TELEVISION: Gossip Girl, Pane Amaro (RAI 3); As the World Turns; One Life to Live; Rage of Angels. 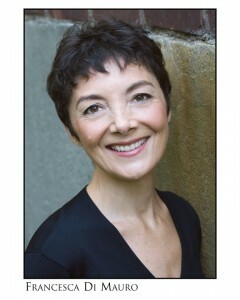 Francesca has also completed numerous narrations and voiceovers in the US and Italy.